Lesson to be learnt: Practice Security in Depth. Never reply on a single layer of security for your applications. Great timing for me as I can now fit this into my final year project report and demonstrate it in my demo!! :) Bad times for all developers relying on the feature to stop XSS. Just found this quote in my project report regarding ValidateRequest. Doesn’t seem to be Vulnerability anymore. This vuln was fixed by the MS07-040 patch. 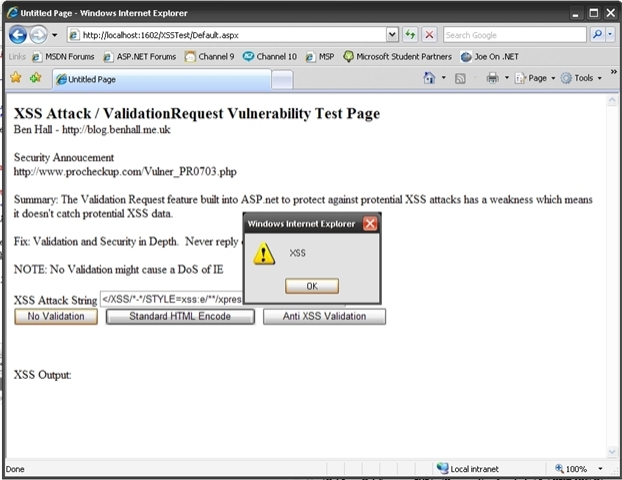 It still might be possible to bypass the ValidateRequest filter for XSS in certain conditions though.